1. Xtend BCAAS- BCAAS are branch chain amino acids are the build blocks of our muscles. BCAAS give you these amino acids in a form that your muscles can use immediately during a workout. They can help to reduce muscle fatigue during a working and can help reduce soreness after. The biggest benefit I notice is the reduce of muscle fatigue while I am exercise. I drink them during my workout and feel like I can lift longer. Bodybuilding.com has some great information on them that you can read here. My favorite flavors are green apple and blue raspberry. 2. 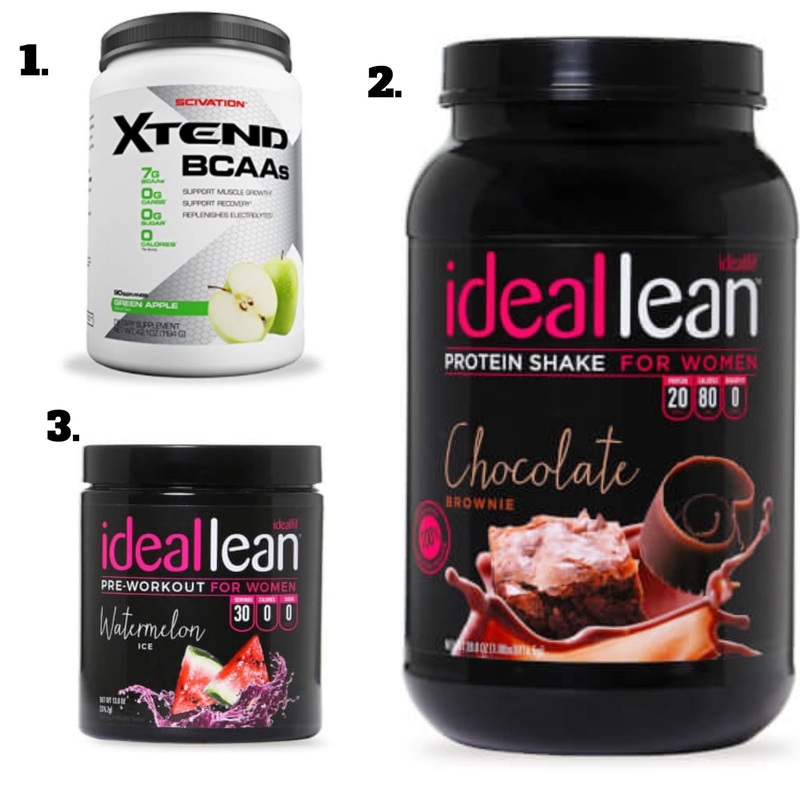 IdealLean Protein- I love this protein because it is create specifically for women. It contains 20 grams of protein in a single scoop and only 80 calories. It also has no carbs, which is definitely a plus when tracking your macros. In terms of flavor, I think it tastes delicious! My favorites are Chocolate Brownie and Chocolate Coconut. I have also tried Mint Chocolate and Caramel Mocha, but don't love them as much. I either mix it with water and drink it, or add it into a smooth with almond milk, ice, spinach, a banana, and some berries or whatever I have on hand. 3. IdealLean Pre-Workout- I tried a pre-workout for the first time after I finished nursing Riley at a year old and it CHANGED MY LIFE! I love taking a pre-workout and it honestly completely changed the game for me when it came to exercise. I had so much more energy during my workouts and I never suffered from a crash later on. I really like this pre-workout again because it is created for women, but also because I get the energy from the caffeine and the tingling pump from the beta alanine. Some people don't like the tingles, but I LOVE them. In fact, a pre-workout is one of the things I have missed the most this pregnancy. I still exercise of course, but have way less energy. I have only ever tried the watermelon and blue raspberry flavors. I love the watermelon, but was not a fan of the blue raspberry.